Dragon Fruit (aka Pitaya) is a beautiful tropical fruit. It has a mildly sweet, tangy taste – especially the ones with bright pink or red flesh. When you open up a dragon fruit, the texture is like a kiwi, and the meat is studded with little black seeds, that are good for your digestion. It’s so beautiful and so loaded with health benefits that I love to use it whenever possible in smoothies, smoothie bowls, ice creams etc. But this year I decided to make a dragon fruit lemonade. It’s beautiful to serve at dinner parties or weekend brunches – will totally delight your guests. You can either try to find the actual fresh fruit in a store with a good Asian section, or you can buy frozen packs of Pitaya that can be used for smoothies and bowls. I love the packs or frozen cubes as they are easy to use. I also had to consider the sweetener I would use as lemons are tangy and the dragon fruit is unsweetened. I decided to go with coconut nectar. Unlike agave syrup, it’s less heavily processed. It’s a low glycemic sweetener that’s made from the liquid sap of the coconut blossoms. However, if you are diabetic, you might be better off using stevia drops. I also added a little apple cider vinegar to make it tangy and for the health benefits. Thaw out the packet of dragon fruit by placing in a cup of water for about 10 minutes. Pour dragon fruit into the cheesecloth and strain. Mix the lemon juice, coconut nectar and vinegar in a measuring jug. Mix in 2 tbsp of the dragon fruit juice. Save the remained in a screw top jar in fridge for up to one week. Fill 4 large glasses with ice cubes. 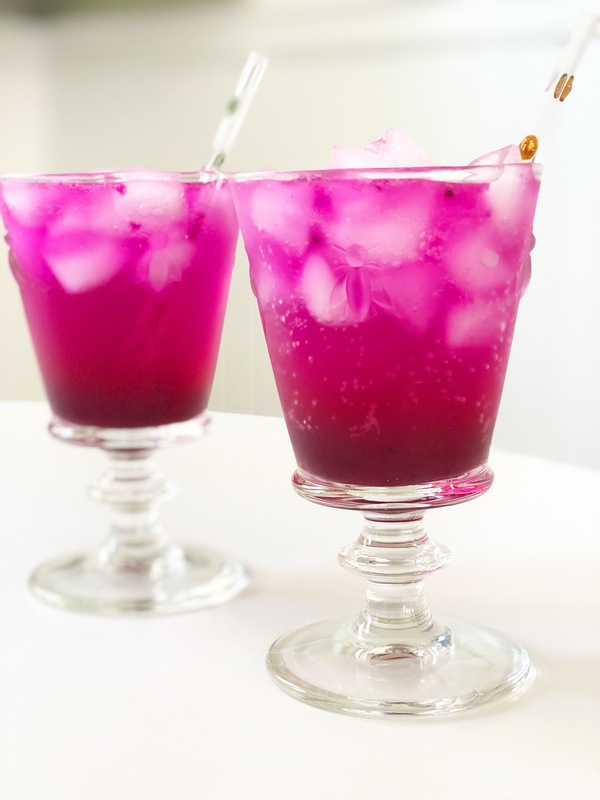 Pour about one inch of dragon fruit/lemon syrup on top of ice. Top up glass with sparkling mineral water.